Quick post here for the weekend. I have no exclusive scoop on this, and many of you may have already heard the word. 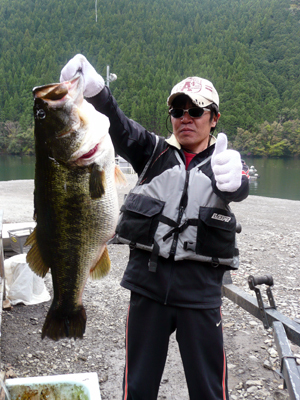 There was another giant largemouth bass caught in Japan; another fish that topped the 20-pound mark. This fish will not be large enough to be a new world’s record, but a H-A-W-G of a bass nonetheless! Here is what a 28-inch largemouth bass looks like. Man, wouldn’t I look good holding that fish? You can read everything I know about the catch here, http://sports.espn.go.com/outdoors/bassmaster/bigBass/news/story?page=b_BigBass_Shimotahira_20100826 . Apparently this fish was caught from another Japanese water, not Lake Biwa where the fish that tied the world’s record was caught, https://barbsandbacklashes.wordpress.com/2010/01/08/it-is-true/ . Largemouth bass are an invasive species in Japan. I believe their story is much the same as many of the aquatic invasive species here in North America–nobody knows for sure how they got there, but they are there and they are a threat to their native fishes. That creates an interesting dilemma as they would just as soon be rid of largemouth bass and bluegills, but obviously those fish have created a following among Japanese anglers. I would bet that they will have to learn to manage them and live with them because it may be impossible to get rid of all of them. Can you imagine considering largemouth bass to be nothing more than “green carp”? Especially when they have demonstrated the potential to reach such huge proportions? The fact that largemouth bass are an exotic species in Japan may be a large part of the reason they grow so large there. In Japanese waters largemouth bass may have little competition from the native predator fish and are able to expand into a new habitat where they are very successful. At some point they may not reach the exceptionally large sizes they are now, but then again if the habitat conditions are ideal we may continue to see some monstrous bass being caught in Japan. Unfortunately a large predator like that could have serious impacts on the ecology of Japanese waters as well.